Schwab takes the lead to educate investors on the benefits of independent financial advice with new ad campaign. 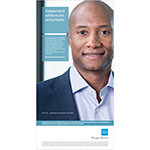 SAN FRANCISCO--(BUSINESS WIRE)--Schwab Advisor Services today announced the launch of a national advertising campaign to advocate for independent financial advisors and raise awareness of the benefits of independent advice among high net worth investors. Underscoring Schwab’s longstanding commitment to independent advisors, the creative campaign features Schwab advisor clients, positioned alongside the Charles Schwab brand. The integrated print and digital campaign was previewed today at Schwab’s annual EXPLORE® conference and will debut nationwide tomorrow. According to Schwab’s latest Independent Advisor Outlook Study (IAOS) , the majority of independent advisors describe themselves as optimistic about RIA growth over the next five years (73%), yet they also expect competition in securing new assets (66%) and they see a need to differentiate their firm from competition as being greater than ever (65%). Schwab partnered with The Richards Group to develop the creative concept. The campaign is based on insights from proprietary consumer research and advisor interviews. The ads themselves are informed by input from advisors who helped articulate the differentiators of independent investment advisors. The campaign represents the most pronounced investment in a national marketing and advertising effort that Schwab has undertaken to date on behalf of independent advisors. The ads will be visible in numerous national print publications as well as large-scale digital media and video rotations, online media properties, social media and paid search channels. Media outlets include The Wall Street Journal, Barron’s, Forbes, The Economist, CNNMoney, MarketWatch and Business Insider. An important part of the campaign is the Independent Advisor Learning Center located online at www.FindYourIndependentAdvisor.com. The site expands upon the success of Schwab’s RIA-focused marketing efforts to date (RIA Stands for You), functioning as a content hub where investors can learn more about independent advisors, with a mobile-enhanced directory feature allowing investors to find and connect directly with an independent advisor in their region. Independent investment advisors are not owned by, affiliated with or supervised by Charles Schwab & Co. Inc. (“Schwab”). Schwab is not affiliated with The Richards Group, The Wall Street Journal, Barron’s, Forbes, The Economist, CNNMoney, MarketWatch and Business Insider.